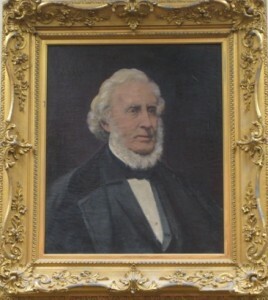 Lithgow Public Library is named for Llewellyn Lithgow, an Augusta merchant and book lover, who left a $20,000 bequest to the City for the purpose of building a public library. The bequest, along with a $9,000 gift from Andrew Carnegie and the sale of subscriptions to area citizens, provided the funds to construct the building. With much fanfare, the cornerstone of the library was laid in 1894, and the doors opened to the community in February of 1896. An addition to the original building was constructed in 1979. Designed in the Romanesque Renaissance style, the library is constructed of gray Norridgewock granite, blocked symmetrically over the windows and entrance. An arched doorway and medallions featuring the names of admired writers adorn the exterior. The interior lobby and original stack room feature quartered oak pillars and elaborate woodwork. Grand fireplaces on the east and west walls face each other. Stained glass windows depict printers’ marks from the 15th and 16th centuries, as well as several scenes from Augusta history. The elegant Reading Room, with its frescoes, stained glass and gold leaf ornamentation, remains much the same as it was in the 1890’s. It is considered one of the most beautiful interior spaces in the state of Maine. The library is on the National Register of Historic Places and celebrated its centennial in 1996.
Who is the man for whom Lithgow Public Library is named? Llewellyn Lithgow was born in Dresden, Maine on Christmas Day, 1796. He spent the first 40 years of his life in his native town, and as an adult engaged in the mercantile business. He was so successful at his trade that he was able to retire at age 40. In 1839, he moved to Augusta with his wife Mary and made it his permanent home. He married a second time to Pauline, in 1869. Mr. Lithgow became an active member of Christ Church (Unitarian) in Augusta, and participated in various community endeavors. He was a life member of the Augusta Literary and Library Association, whose home was on the second floor of the Meonian Hall Block on Water Street. Despite the many subscriptions and memberships sold by the Association, its finances declined and the group prepared to disburse the collection and dissolve the library. This confidential knowledge became known in 1881, when Llewellyn Lithgow died suddenly and his will became public. He left a bequest of $20,000 to the city of Augusta for the purpose of establishing a public library. 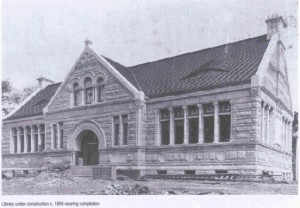 Like Andrew Carnegie, Mr. Lithgow believed that everyone, regardless of their circumstances, should have the same opportunities for “study and mental improvement.” The trustees of the Association incorporated as the Trustees of Lithgow Library and Reading Room, and began raising the necessary funds to construct the building at Winthrop and State streets. By all accounts, Llewellyn Lithgow was not an ostentatious man, and he gave this gift from quiet and firm conviction. In the words of Charles Nash, “Mr. Lithgow was a gentleman of the old school. To urbane manners and a genial disposition he united a broad, public spirit, and a great probity of character, qualities which one him universal confidence and respect.” Now, over 120 years following the dedication of the library, like-minded citizens seek to ensure the future of the vital community institution that bears his name. Share book reviews and ratings with Lithgow Public Library, and even join a book club on Goodreads.